Pterygium recurrence that leads to limbal region destruction may be linked to the locally invasive behavior of benign infiltrating growths in other parts of body. Bare sclera technique, beta irradiation, and buccal mucous membrane grafting in the present era of pterygium management are totally replaced by more promising methods with very low recurrence rates and low incidence of long-term postoperative complications. In our previous two published studies, autologous conjunctival grafting showed reliable results with very low recurrence rate compared to mitomycin C (MMC) that revealed unpredictable ocular surface problems with moderately acceptable success rate. Another was a prospective study that revealed hundred percent success rates and zero recurrence rates with autologous limbal conjunctival grafting for primary pterygium. The purpose of the present review on pterygium is to identify the most successful method with least recurrence rates and low complications with longer graft survival rates. Pub med literature was searched for published papers within 5 years focusing on recurrence rates and pterygium related complications. Statistical analysis performed on sample size, method chosen, intra- and post-operative complications, recurrence rates, follow-up duration and graft survival rates. Recurrences rates for conjunctival grafting group with or without adjuvant (antimitotic agents), limbal conjunctival group with or without adjuvant (antimitotic agents), and MMC applications only and amniotic membrane transplantation (AMT) were analyzed. A literature search was performed in PubMed database for the analysis of recurrence rates and complications with respect to various modalities of pterygium treatment are discussed under following subheadings. Best method was selected on the basis of larger sample size, longer graft survival rate with longer follow-up duration, and zero recurrence rates. We did not find larger prospective studies on amniotic membrane grafting as sole method for pterygial management despite very low recurrence rates published by previous studies. The role of MMC as for monotherapy is controversial due to unpredictable early and late postoperative complications, large variations in concentration, application time, dose and time of frequency, and route of administration. Five prospective studies employed MMC and reported various complications sometime leading to significant visual and ocular surface problems. Pre- and intra-operative or subpterygial, subconjunctival injection was given, and some studies used topical application during the pre-, intra-, and post-operative course of management. Toker reported higher recurrence rate with AMT when fixed with fibrin glue, and Nguyen stated that pterygium surgery with AMT had less conjunctival inflammation and dry eye in patients receiving fibrin glue than those with Vicryl 8–0 sutures. With the advent of antivascular endothelial growth factor (VEGF) agents' diabetic retinopathy induced neovascularization treatment had dramatically changed in recent past years. With successful treatment of posterior segment inflammation now anti-VEGF administration has a questionable role in corneal vascularization, anterior segment inflammation, and pterygium management. Greater risk of subconjunctival hemorrhage was observed in a meta-analyses on randomized controlled trial (RCT) on pterygium treatment with bevacizumab institution. Recurrence rates are still higher with anti-VEGF for pterygium management. Published studies showed limitations in sample size and longer duration of follow-up with higher recurrence compared to CAU and LCAU procedures and no statistical significance with the dose of bevucizumab ,,, [Table 1]. Secondary complications that were managed successfully were Dellen ulcer, tenons cyst, suture granuloma formation, pyogenic granuloma, graft retraction, graft edema, graft hemorrhagic edema, graft bleed graft dehiscence, irritative symptoms, scleral thinning, persistent redness, secondary epithelialization, conjunctival inflammation, infection, scleromalacia, impaired visual acuity, and strabismus. Summary of the important results include successful treatment with CAU as monotherapy and CAU with intraoperative MMC as adjuvant followed by LCAU as sole therapy with nil to very low recurrence rates based on RCTs, prospective, meta-analyses retrospective studies. Future implications of this review would be on community-based research with large sample size inclusion and longer follow-up duration to know regarding graft survival period and achieve hundred percent success rates. Krishnacharya PS. Comparative study of the results of 0.04% mitomycin-C and simple conjunctival autograft for primary pterygium. Apollo Med 2013;10:201-4. Prabhakar SK. Safety profile and complications of autologous limbal conjunctival transplantation for primary pterygium. Saudi J Ophthalmol 2014;28:262-7. Hirst LW. Recurrence and complications after 1,000 surgeries using pterygium extended removal followed by extended conjunctival transplant. Ophthalmology 2012;119:2205-10. Kocamis O, Bilgec M. Evaluation of the recurrence rate for pterygium treated with conjunctival autograft. Graefes Arch Clin Exp Ophthalmol 2014;252:817-20. Paracha Q, Ayoob M, Dawood Z, Mirza SA. Recurrence rate with use of intraoperative mitomycin C versus conjunctival autograft following pterygium excision. Pak J Med Sci 2014;30:1243-6. Toker E, Eraslan M. Recurrence after primary pterygium excision: Amniotic membrane transplantation with fibrin glue versus conjunctival autograft with fibrin glue. Curr Eye Res 2016;41:1-8. Abdalla WM. Efficacy of limbal-conjunctival autograft surgery with stem cells in pterygium treatment. Middle East Afr J Ophthalmol 2009;16:260-2. Mery G, Maalouf T, George JL, Angioi K. Limbal-conjunctival autograft in pterygium surgery. J Fr Ophtalmol 2010;33:92-8. Young AL, Ho M, Jhanji V, Cheng LL. Ten-year results of a randomized controlled trial comparing 0.02% mitomycin C and limbal conjunctival autograft in pterygium surgery. Ophthalmology 2013;120:2390-5. Nuhoglu F, Turna F, Uyar M, Ozdemir FE, Eltutar K. Is there a relation between histopathologic characteristics of pterygium and recurrence rates? Eur J Ophthalmol 2013;23:303-8. Soliman Mahdy MA, Bhatia J. Treatment of primary pterygium: Role of limbal stem cells and conjunctival autograft transplantation. Eur J Ophthalmol 2009;19:729-32. Nguyen LP, Wang Z, Molina J, Tellez A, Chemoriya T. Complications of fibrin glue in pterygium surgery with amniotic membrane transplant. Eye Sci 2012;27:19-24. Mandour SS, Marey HM, Farahat HG, Mohamed HM. Preoperative versus intraoperative subpterygial mitomycin C injection for prevention of pterygium recurrence. J Ocul Pharmacol Ther 2015;31:340-3. Jiang J, Gong J, Li W, Hong C. Comparison of intra-operative 0.02% mitomycin C and sutureless limbal conjunctival autograft fixation in pterygium surgery: Five-year follow-up. Acta Ophthalmol 2015;93:e568-72. 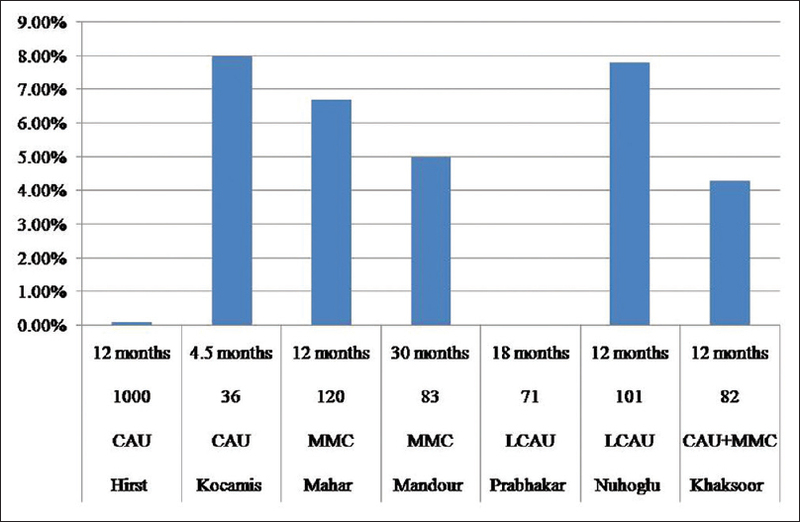 Khakshoor H, Razavi ME, Daneshvar R, Shakeri MT, Ghate MF, Ghooshkhanehi H. Preoperative subpterygeal injection vs intraoperative mitomycin C for pterygium removal: Comparison of results and complications. Am J Ophthalmol 2010;150:193-8. Olusanya BA, Ogun OA, Bekibele CO, Ashaye AO, Baiyeroju AM, Fasina O, et al. Risk factors for pterygium recurrence after surgical excision with combined conjunctival autograft (CAG) and intraoperative antimetabolite use. Afr J Med Med Sci 2014;43:35-40. Hu Q, Qiao Y, Nie X, Cheng X, Ma Y. Bevacizumab in the treatment of pterygium: A meta-analysis. Cornea 2014;33:154-60. Motarjemizadeh Q, Aidenloo NS, Sepehri S. A comparative study of different concentrations of topical bevacizumab on the recurrence rate of excised primary pterygium: A short-term follow-up study. Int Ophthalmol 2016;36:63-71. Ozsutcu M, Ayintap E, Akkan JC, Koytak A, Aras C. Repeated bevacizumab injections versus mitomycin C in rotational conjunctival flap for prevention of pterygium recurrence. 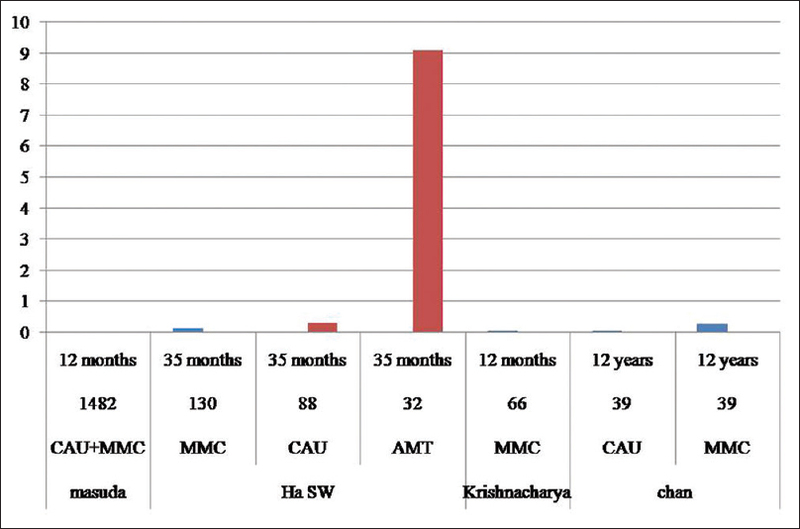 Indian J Ophthalmol 2014;62:407-11. Razeghinejad R, Banifatemi M, Hosseini H. The effect of different doses of subconjunctival bevacizumab on the recurrence rate of excised primary pterygium. Bull Soc Belge Ophtalmol 2013;322:13-20. Ha SW, Park JH, Shin IH, Kim HK. Clinical analysis of risk factors contributing to recurrence of pterygium after excision and graft surgery. Int J Ophthalmol 2015;8:522-7. Lindquist TP, Lee WB. Mitomycin C-associated scleral stromalysis after pterygium surgery. Cornea 2015;34:398-401. Chan TC, Wong RL, Li EY, Yuen HK, Yeung EF, Jhanji V, et al. Twelve-year outcomes of pterygium excision with conjunctival autograft versus intraoperative mitomycin C in double-head pterygium surgery. J Ophthalmol 2015;2015:891582. Masuda A, Takahashi K, Nejima R, Minami K, Miyata K. Pterygium excision using bulbar conjunctival autograft with intraoperative mitomycin C for primary pterygium: A retrospective assessment of 1832 eyes. Nippon Ganka Gakkai Zasshi 2013;117:743-8. Shi WY, Wang FH. Mitomycin C related complications shouldn't be neglected in the pterygium surgery. Zhonghua Yan Ke Za Zhi 2013;49:869-72. Mahar PS, Manzar N. Pterygium recurrence related to its size and corneal involvement. J Coll Physicians Surg Pak 2013;23:120-3.